The preschool our son attends is wonderful. His primary teachers have Dexcom Share on their phones, and we usually text several times a day about carbs or insulin dosing. Here’s a text we got a few days ago. Yes, his teacher picked out a dried blueberry, raisin, cherry, craisin, and part of an apricot, weighed them, took a picture, sent a text, waited for an answer, and delivered insulin to our kid. In a preschool classroom. This is to say nothing of the Bakery Unit they had last month, which was also handled with care and attention. This morning, Henry graduated from preschool. I have all the normal parent feelings of time passing too quickly, pride, and fear as my child grows bigger into a much bigger world. But, I also have caregiver-parent feelings, which are messier, more full of fear and dread. I try not to let those caregiver-parent feelings invade these happy milestone moments, like leaving preschool and starting kindergarten. However, milestone moments are inherently reflective. So, the thoughts of my son’s short, but complicated history, coupled with a future inextricably linked to a chronic disease, sometimes share space with joy. If I’m not saying this clearly, Pixar did: think of Sadness and Joy from Inside Out. He’s five and has lived a life of more medical intervention than me, and most other people my age. His medical history (not all related to diabetes) is a long list of specialists: pediatric neurologist, neonatologist, ENT, immunologist, pediatric endocrinologist, infectious disease specialist, E.R. physicians, multiple anesthesiologists, and several primary care physicians. I stood beside his isolette in the NICU for weeks after his birth and climbed into five separate hospital beds with him over the past five years, and I know I’ll need to be prepared to climb in again. I’ve seen my son, and he’s seen me, in really scary basins and valleys, so we’ve learned the value of looking at something else: a tenacious mountain goat climbing a rock face, a cool cat handing a diploma to a kid who is going to rock kindergarten. Henry with his preschool teachers, a preschool diploma, and TC! I like my birthday less than I used to. Of course it still happily marks another year of life to celebrate with friends and family, but March 5th also marks the last day my son would ever not have type 1 diabetes. On March 6, 2016, my son has been living with (diagnosed) T1D for 731 days (there’s a leap year in there), roughly 37% of his life. We haven’t figured out how to mark or celebrate his diaversary, a neologism for the anniversary of a diabetes diagnosis. I think we’ll wait for Henry to take the lead on this. However, I’ve been reflecting on this upcoming date for a few weeks now. Moments like this are mile-markers because they disrupt the routine of counting carbs, insulin delivery, and correcting highs and lows. If I think about the preponderance of diabetes care all at once, it’s overwhelming, so the task-to-task perspective allows me to get up each day, put my boots on, and do it all again. Yet, around these mile-marker moments, I usually peek out the window at the vast appalling and inspiring mountain range that is T1D management. On March 1st, I recorded all my actions related to T1D care. Here’s one day of T1D care. It’s only one day. Some days are better. Some days are worse. We’ll do it all again tomorrow. 11:17 a.m.-text from Henry’s preschool teacher/s: We did another ezBG at 10:30 and it gave another .3. He had 1.07 IOB at the time. 11:45 a.m.- Husband calls during class, saying he went to check on Henry, who has large ketones. Pump said to give 6.6, but this would be way beyond the most insulin Henry’s ever had at once, and it made my husband nervous, so he gave Henry 5.6 units of insulin to correct for large ketones and cover his lunch of grilled cheese and tomato soup. 5.6 is the second highest amount of insulin Henry’s ever had on board. 1:53 p.m.- text from Henry’s preschool teacher/s: We gave another unit and are continuing to push water. Will have cheese stick and beef stick for snack, husband texts back and asks that Henry be given 1 additional unit of insulin to help clear ketones. 3:08 p.m.- look at BG remotely, 141 with double arrows down, which means Henry’s BG is falling faster than 3mg/dL per minute, text to his teacher/s: Now he’s falling fast! What’s his real BG and how much IOB? 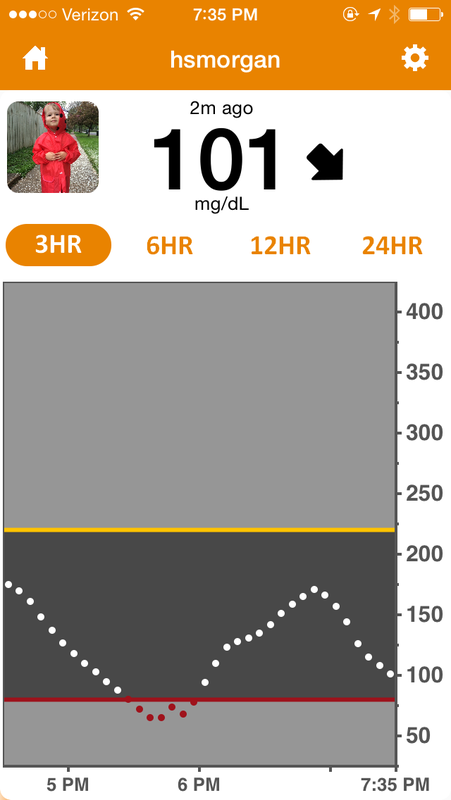 11:42 p.m.- check BG on CGM, 158, an arrow straight across, set alarm for 12:40 a.m., 3:00 a.m., and 6:00 a.m. The name shift seems simple, but it’s packed with emotions, implications, and for some, even anger. I wrote a piece, Diabetic v. Diabetes, shortly after the ADA published the 2016 Standards of Medical Care in Diabetes, which explained the name change. 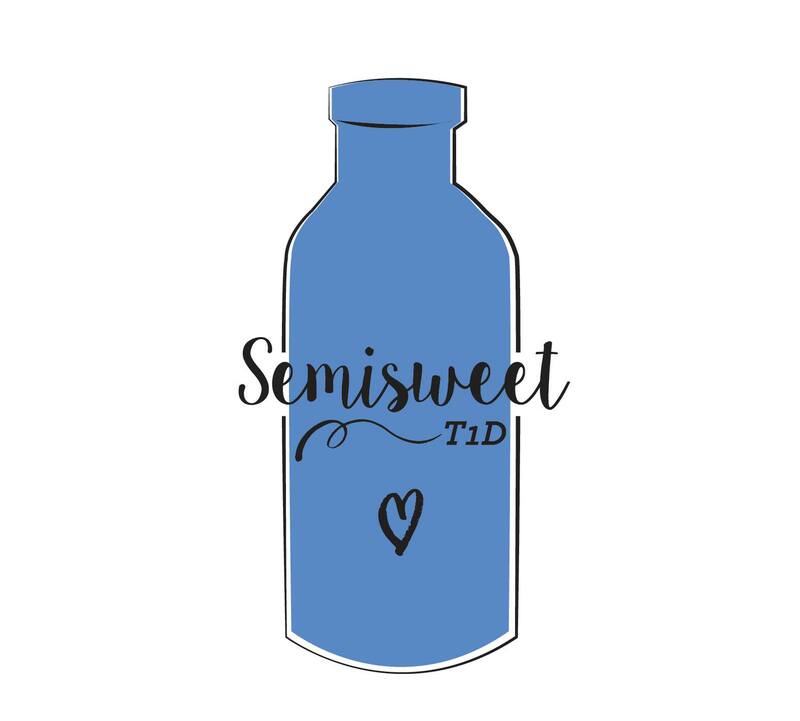 When I linked to the article on Semisweet’s Facebook page, within seconds, the first comment was, “This is stupid.” Beyond Type 1 featured the article, and it garnered some healthy debate on the Beyond Type 1 Facebook page as well. Some people see diabetic v. diabetes as splitting hairs or unnecessary political correctness. When I encounter the people who prefer to be called “diabetic,” or at least voice a strong and angry opinion against those asking to be called, “person with diabetes,” I respect their right to be called “diabetic.” In general, it seems these people have lived with the disease for many years— years when the battle was greater because technology wasn’t as advanced and understanding was scarer. Usually, these people are adults; however, children are more sensitive to language, labels, and their implications. In fact, we’re all probably not too far removed from that hateful comment or name someone hurled at us on the playground. The governing associations like American Diabetes Association are changing their language, and I think this is because our perception and understanding of diabetes is changing. To be “a diabetic” was a certain death sentence 94 years ago. After insulin, to be “a diabetic” meant doctors predicted vastly shorter lifespans; fear and misunderstanding from teachers, relatives, and the larger medical community impacted people’s lives negatively. Women with T1D were told they could not and should not have children (case in point, Steel Magnolias). In this era of better treatment, people with diabetes can live normal lifespans with fewer complications. As more and more people live longer and better with T1D, we’re starting to understand that living with a chronic disease or condition, like diabetes, has impacts on our emotional health, romantic relationships, and mental health. Having diabetes, means we can talk about this, and if we talk about being “diabetic” versus living with diabetes, there’s a simple paradigm shift at work: a limited life vs. a limitless life. In images, the paradigm shift looks like this. Below is the picture of a child who’s just been given a shot of insulin for the first time in 1922, and he’s starting to wake up from DKA. He was in a Canadian hospital with a ward for diabetic children. Just weeks before, his parents sat at his literal death bed. He’s a picture of 4 time Olympian, Kris Freeman. He happens to have Type 1. In the photo, he’s training for another race and is wearing an insulin pump, Omnipod, on his arm. In both pictures, we can see the life that insulin makes possible, and what’s harder to discern, but still visible, are the implications of being diabetic versus having diabetes. Being diabetic once meant limitations, and yes, having diabetes requires my son to make sacrifices and take extra steps, but being a person with diabetes puts the focus on personhood. Thankfully, we’re living in an age when having diabetes means it’s a conversation about what we can do instead of what we can’t, and that’s ultimately the difference between diabetes and diabetic. I used to teach English at a distinguished college preparatory high school in Los Angeles. Occasionally, the faculty would bemoan the “helicopter parent” after an exhausting and ghastly encounter. For example, a father told me his son, a sophomore in my composition class, could not complete the homework because the son was sad his pet goldfish died. Another mother drove her son’s homework to school after she completed it for him. At my classroom door, in front of his class, she explained he was too excited to do his homework last night after he found out he made the freshman football team. Even helicopter parents understand that if they always tie their child’s shoe, the child will never learn to tie a shoe. But parenting is a complicated paradox: as a parent, my job is to make myself obsolete. The whole business of parenting is weaning. The process of weaning and independence is easy to see with young children, when desire precedes ability, and they want to pour the milk or pick out their own clothes. After many days and years of scaffolding independence the hope is my children will get an education and job, be able manage money, make decisions to safeguard their health, find people that make them happy, and join communities. That’s how the whole plan is supposed to proceed, but the plan requires revision when a chronic disease enters the scenario. Our four year old has type 1 diabetes. Now our job is to aim for all the aforementioned things, but also to daily administer a drug, insulin, which preserves his life, but could take it. In a few years, we’ll have to teach him how to deliver this same drug. We have to teach him how to wear medical equipment (Animas pump and Dexcom) on his body 24 hours a day and how to take care of this equipment. We’ll have to teach him how to heal and advocate for himself when he encounters unkind or ignorant people. School is starting, so a parade of parents are meeting with educators and administrators about 504 plans, and educating staff on caring for a student with T1D. In her article, “What It’s Really Like To Raise A Child With Diabetes” on The Huffington Post, Lisa Gastaldo explains some of the fears and realities of diabetes care from a parent’s perspective, as well as her history of working well with schools and doctors. I think it’s a great read to pass along to teachers and family members who may not recognize the trials of living with diabetes. Even people who are in the diabetes community debate when and what a parent’s role in T1D care should be. As CGM in the Cloud and Nightscout emerged and engaged in important debate with Dexcom over moving to an FDA approved platform that enabled sharing of CGM data, people in the diabetes care industry predicted that the helicopter parents of T1D children would be distracted and consumed by the data. We’ve had Dexcom share since June, and have found the opposite to be true. Rather than wondering what our son’s blood glucose is, and texting or calling to find out, we look at the number and move on. We’ve been able to leave our son with family members for the first time since diagnosis. Just this week, both of Henry’s preschool teachers downloaded the app on their phones and marveled at how this continuos stream of information would make monitoring and care easier in the classroom. My job is primarily to be a parent, but as I watch my four year old son struggle to put on a pair of pants while holding an insulin pump, I realize my other more arduous job is to be a parent to a person with type 1 diabetes. How long do I watch him try to untangle the tubing from his pants before I step in? To stall, I play a trick on myself and say this is like any other challenge every other kid faces, right? I tell myself only the scenario is different, but then Henry looks at me in frustration. He asks for help, and I can see on his face that he knows this struggle is different, more intricate and undue. There’s no need to say anything in this moment that requires action. Instead, we sit down on the floor, where he can place his pump, and find a new way to put on pants.